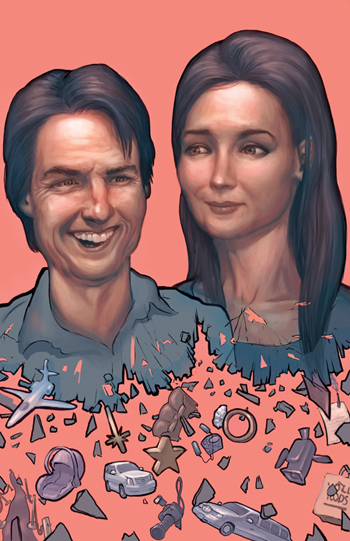 It’s been a little over a year since the epic flame out of Tom Cruise and Katie Holmes’ relationship. Along with a lot of tabloid fodder, their hyper scrutinized love story provided a fitting cultural checkpoint, falling smack in the center of the Venn diagram for our celebrity obsession, our fear of oligarchical institutions, and our need to dissect these things via social media. Arriving in the New York Fringe after a lauded run in Chicago, playwright Brandon Ogborn’s satirical play, The Tomkat Project, delightfully recounts the peculiar media theatrics of Tom and Katie’s story. Considering that the erratic Cruise, the side-mouth-talking Holmes, and the Church of Scientology – which was apparently involved in nearly every aspect of their relationship – are fairly easy targets for a madcap send-up, this might have been the theatrical equivalent of shooting fish in a barrel. But Ogborn, who narrates the play, impressively sets aside some time at the end to truly consider what the Tomkat story means in the context of our culture, and even goes as far as second guessing his own artistic instincts, live on stage. It is indeed staggering to recall the bombastic events of Tom and Katie’s relationship – the couch jumping! The box office billions! The premarital pregnancy! The shuffling of managers! The Brook Shields antidepressant meltdown! The silent birth! Certainly, I knew that all of this was ridiculous while it was happening, but reliving their omnipresent relationship at a remove in this fun truncated form… it really does seems like utter insanity. Like a story about Greek gods gallivanting about and generally having their way with an enthralled world. Director Elly Green entertainingly stages this celebrity farce in a workshop style, with the extraordinary cast of six seated in chairs behind the action. There they sit until it comes time to leap into one of a myriad of supporting roles, including Holmes’ parents, Cruise’s agents and lawyers, Scientology guru David Miscavige, Matt Lauer, Steven Spielberg, and, of course, Oprah Winfrey. Julie Dahlinger and Walt Delaney excel especially in their portrayals of the title characters; Dahlinger hilariously simulates Holmes’ head bob/hair tuck maneuver, and Delaney just nails the rictus grin of Cruise’s creepy silent laugh. Near the end, Allison Yolo portrays Maureen Orth, the Vanity Fair journalist who wrote the definitive post-break-up article on Tomkat. The story Orth told tells of the courageous Katie Holmes, who dared to defy sinister husband and his creepy Church in secret, hoping to provide a better life for her and Cruise’s daughter, Suri. Ogborn ultimately fashions Orth into his chief antagonist in the narrating of the story and directly challenges Orth’s one-sided account of the events. Things get very meta very quickly, with Ogborn essentially insisting that his intentions in creating this play are much nobler than those of the muck-raking Orth. It’s a fun twist that just when the audience starts to question the point of such a thorough – and thoroughly funny – exploration of the subject, Ogborn does too. He never does find the deeper meaning in the material that he seems to be searching for, but maybe that’s Ogborn’s point: celebrities are only as deep as we allow them to be.